Olga Zaitseva has finally broken Russia’s bad luck in the biathlon World Cup, winning the 15-kilometer race in the fifth stage of the competition. ­The 32-year-old hit all 20 targets at the shooting range and clocked 41 minutes 46.1 seconds at the track at Ruhpolding, Germany. 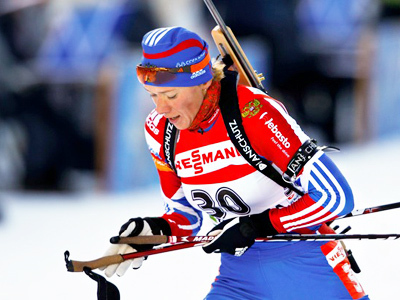 It was Zaitseva’s ninth career success, recording her last triumph at a World Cup stage back in March 2009 in Norway. Home favorite Andrea Henkel pleased the crowd with second place finish, 14.5 seconds behind the leader. Sweden's Helena Jonsson came third as all three podium finishers were flawless in the shooting range despite the rainy conditions. Meanwhile, Kaisa Makarainen of Finland finished eighth to retain her overall World Cup lead with 459 points from 10 races. The action in Ruhpolding continues on Friday with the men's 10km sprint.